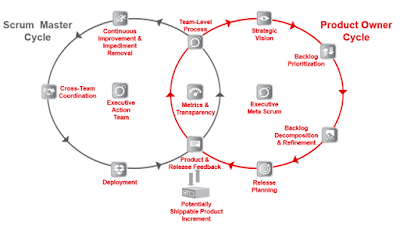 Das Teamwork-Blog: The enemy of Scrum is not Waterfall. The enemy of Scrum is "Bad Scrum". The enemy of Scrum is not Waterfall. The enemy of Scrum is "Bad Scrum". Avi Schneier (/1/), contributor to Scrum@Scale, mentioned this in a fishbowl discussion regarding scaling Scrum at the Global Scrum Gathering last week in London. So, how to avoid bad Scrum? There is a lot of material regarding single team Scrum, that works. The bootstrap is the Scrum Guide. (/2/) But how to avoid this situation in a scaled environment? Scrum@Scale addresses this situation. 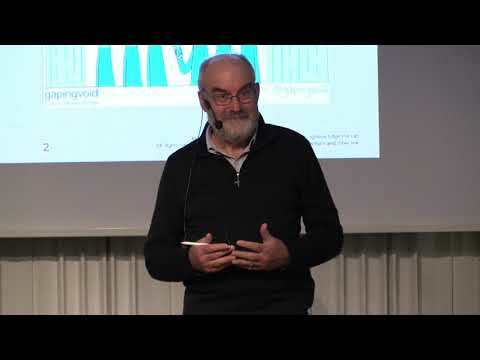 It is "a framework within which networks of Scrum teams operating consistently with the Scrum Guide can address complex adaptive problems, while creatively delivering products of the highest possible value." (/3/) For a detailed description of Scrum@Scale read the Scrum@Scale Guide. Scrum@Scale is a framework, that consists of components. It does not prescribe specific processes. In this article I want to describe two practices, to establish some components of Scrum@Scale. Imagine we are a company working with banks. Among others banks currently struggle with decreasing profits, legal restrictions and changing customer behavior. In this example our company delivers solutions for our clients on how to cope with this situation. working on the overall bank's customer experience. How will we, as a company, create, sell and maintain products for our customer banks in the future? Each team has between three and nine people, working in two week Sprints. They have common Sprint Reviews, in which stakeholders (some of the department's executives) take part. After individual team Retrospectives they have an overall Retrospective. But since our company started with Scrum to experiment with it, the teams are not full time Scrum teams. After two Sprints we assess our Scrum in an overall Retrospective and find out: conflicting priorities. This is a very typical issue with not full time Scrum teams. Their members struggle with having enough time for working off backlog. (/4/) So we need to find out, how to prioritize within the department to ensure everybody has enough time to work on the teams. how new and how urgent is the topic (right)? do we deliver on time and is the customer fully satisfied with the delivery (top)? Now let's try to sort the 10 most important topics by business value. In this example it fails. There is no sense of clear priorities, no sense of direction. In a real life situation this is the first step: Understanding the situation, abandon wishful thinking. The working environment is a patchwork rug. Who in Scrum is responsible for the priorities? The Product Owner. Who in a scaled Scrum is responsible for the overall priorities? The Chief Product Owner (CPO). What would you do in this situation? Work with the CPO on creating an overall backlog for our department. But what happen's when don't do this and how would the teams feel about this? Every Sprint the teams assess their team happiness and their happiness with the department within they work in. 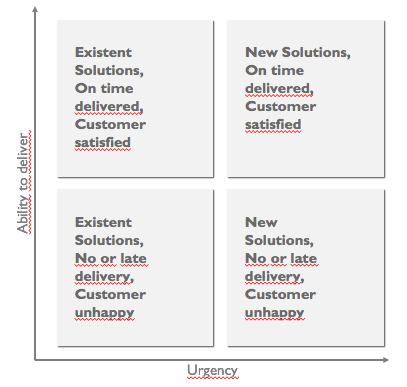 Assume one team is particular exposed to the departments' lack of alignment. Their happiness index decreases over time significantly. The effect of this over time is: less output. So look into the causes of their unhappiness. In the example we discover, that the conflict between stakeholders (differing expectations and unclear requirements) affects their ability to deliver, which makes them unhappy. We confront the executives as stakeholders with these numbers. They agree to take part in an Executive Action Team, to create an environment, that supports the teams and removes these impediments. One of the executives accepts the role of the Chief Product Owner, agreeing to work with the product owners to work on an aligned backlog. 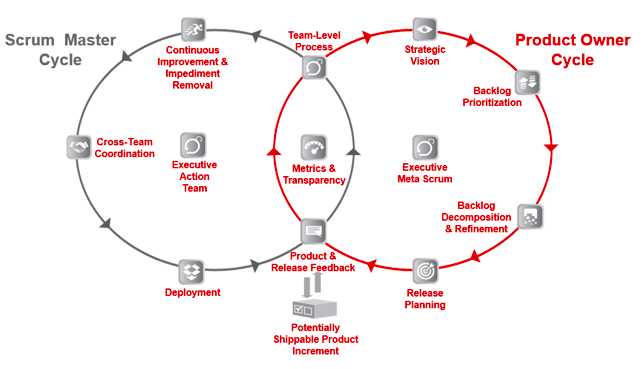 Form a MetaScrum, in which the Product Owners collaborate on a Strategic Vision, Backlog Decomposition & Refinement, agreeing on a Release Plan and communicating this with the teams. The Chief Product Owner coordinates the priorities. Use the "Happiness Metric" in a scaled environment to drive performance for all teams (Metrics & Transparency, Continuous Improvement & Impediment Removal).